The latest AMG executive sedan adds more beast without losing any bit of beauty. Thirty-year-old German racing driver Jan Seyffarth is at the helm of the GT S to help guide me around the best lines on this track. Known informally as Portimão, it’s the one featured in Episode One of The Grand Tour. It’s a wide, fast circuit with lots of elevation change and blind turns, and the E63 S just eats it up. As I cross the start-finish line, the speedometer flashes past 200 kilometers per hour (124 miles per hour); just before the braking marker, it’s somewhere north of 240 km/h. I dive deep into the optional carbon-ceramic brakes fitted to this car, which faithfully scrub speed lap after lap after lap, and dial in steering angle through the weighty, accurate three-spoke wheel. With the air suspension set to Sport+ mode, there’s almost no roll before the E63 faithfully scribes a big arc. All-wheel drive lets me unleash a wave of torque far earlier than should be possible, snapping upshifts through the nine-speed ‘box with the tactile paddle shifters. And there’s so much torque so early in the rev range, I don’t even need to downshift as much as I expect. Grippy, accurate, and fast, the E63 is supremely satisfying out here. 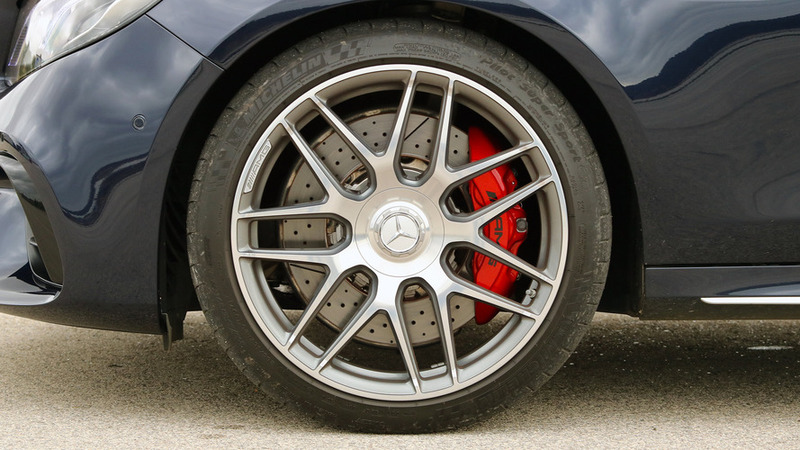 Grippy, accurate, and fast, the E63 is supremely satisfying. So it’s a monster, even with a jet-lagged driver who’s never been to this track before. Yet at the same time, the new E63 S is barely any less luxurious than a standard E-Class. It’s the quintessential autobahn bruiser that will devastate a circuit but completely unwind you on the drive home. 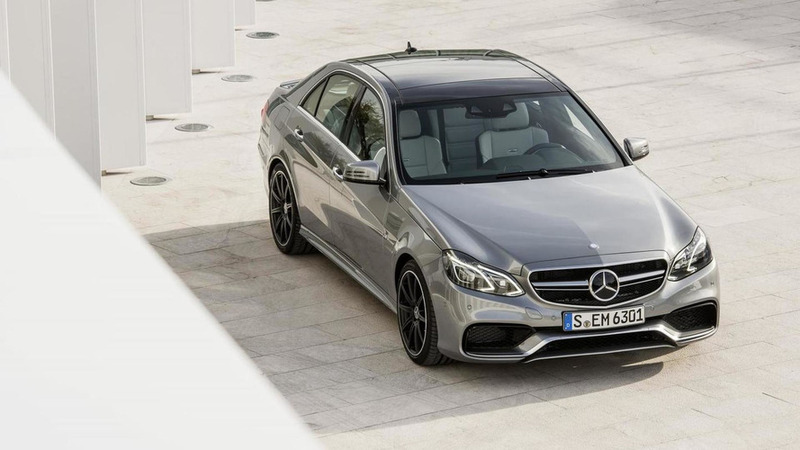 The latest E63 builds upon the newest version of Mercedes’ executive sedan with a classic instruction set: more power up front, new aerodynamic parts out back, stiffer suspension all round, and grippy tires to work with the upgraded brakes. Its flared fenders widen the car by 0.67 of an inch compared to a standard E-Class, and a new front fascia with massive intakes helps cool and feed the engine. Out back, a diffuser and trunklid spoiler reduce lift at speed. 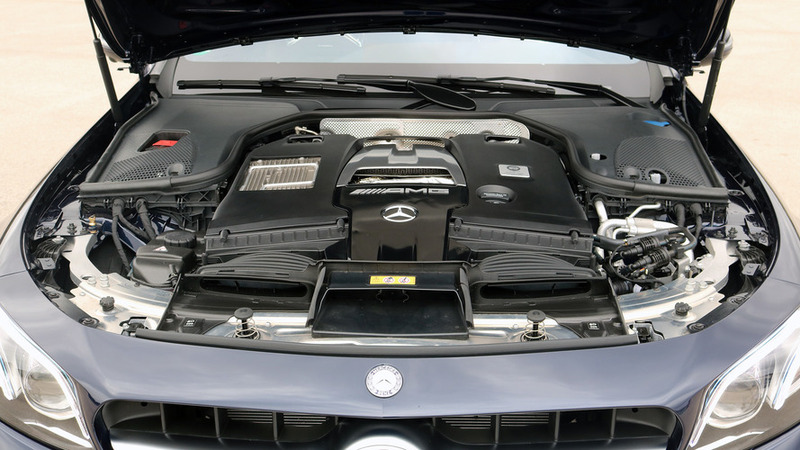 The biturbo 4.0-liter V8, dubbed M177, shares its basic design with the engines in the AMG GT S and C63, though it has unique, twin-scroll turbochargers and different programming. The twin-scroll turbos, which are mounted in the engine’s valley in what’s known as a hot-V design, were chosen because they build boost pressure more quickly than single-scroll designs. 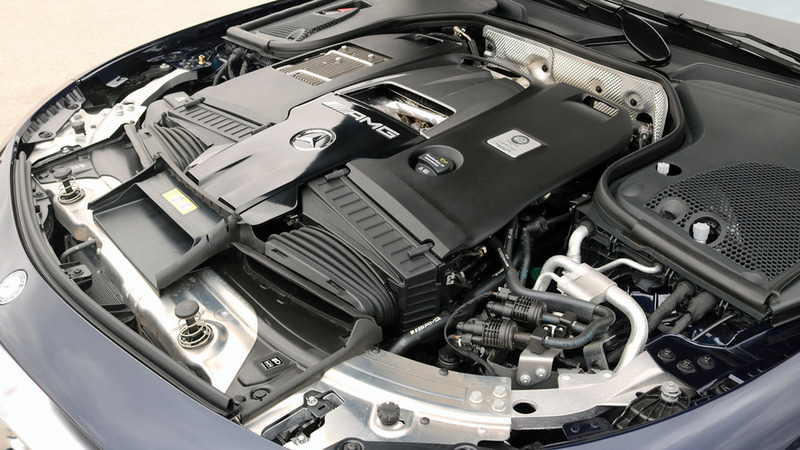 Total output is 603 horsepower and 627 pound-feet of torque, making this the most powerful factory E-Class ever sold. Those are serious figures: it’s more powerful than the AMG GT S we’re chasing on track, and in fact produces more torque than any of Mercedes’ SLS supercars ever produced. It’s more powerful than the AMG GT S we’re chasing on track, and in fact produces more torque than any of Mercedes’ SLS supercars ever produced. In partnership with the nine-speed automatic transmission (which has a wet clutch instead of a torque converter) and 4Matic all-wheel drive, it’s enough power for a claimed 3.3-second sprint to 60 mph with launch control, and a limited top speed of 186 mph. 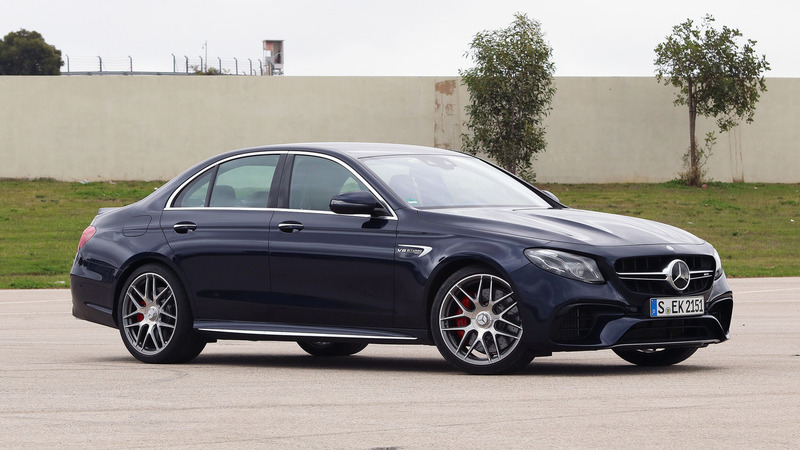 AMG will also sell you a non-S version of the E63, where the engine makes 563 hp and 553 lb-ft, which manages a 3.4-second run to the benchmark and has a 155-mph limiter. The 4Matic all-wheel drive is standard, even in Europe, but whereas most 4Matic setups have a predefined front-rear torque split, that’s not the case for the E63 S. “The distribution changes constantly depending on the driving situation,” says Mercedes-AMG vehicle development chief Mathias Schöttle. In high-speed, straight-line driving, almost 100 percent of the engine’s output goes to the rear tires, but in most situations the car’s computers open and close a multiplate clutch to shuffle some torque forward. The rear differential is an electronically controlled locking unit. There’s also a Drift mode for the 4Matic system, which configures the center clutch pack to a 0/100 front/rear split so the E63 S is a true rear-wheel-drive car. 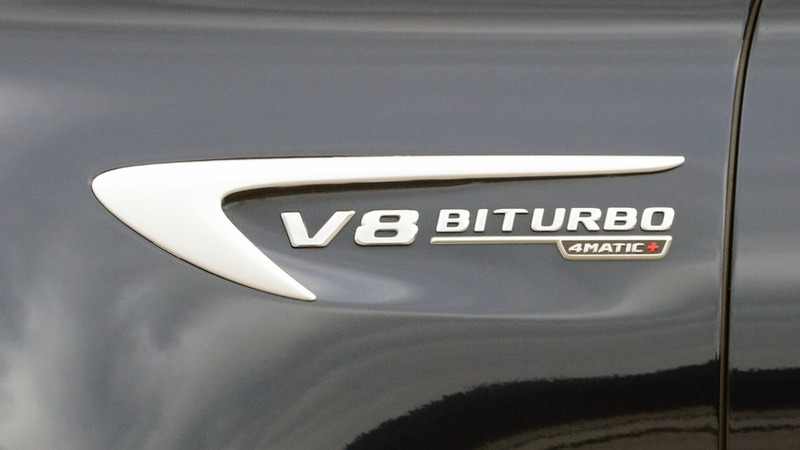 Mercedes techs cruelly but perhaps wisely disabled it on the cars we drove, but I look forward to YouTube videos of owners demonstrating Drift mode when the E63 S reaches the U.S. in summer 2017. To activate it, you choose Race mode, hold the stability control button until it is fully disabled, select manual-shifting mode, then hold both shift paddles until a confirmation message appears. Good luck. The E63 is incredibly pleasant for a car with so much performance potential. Fuel savings come from a cylinder deactivation feature that, when the engine is turning between 1,000 and 3,250 rpm in Comfort mode, can disable four of the eight cylinders. The transmission also has a sailing feature to reduce drag when coasting. U.S. efficiency figures aren’t yet ready, but European ratings for the E63 S convert to 25.8-26.7 miles per gallon, though that’s no doubt higher than the strict EPA cycle will return. 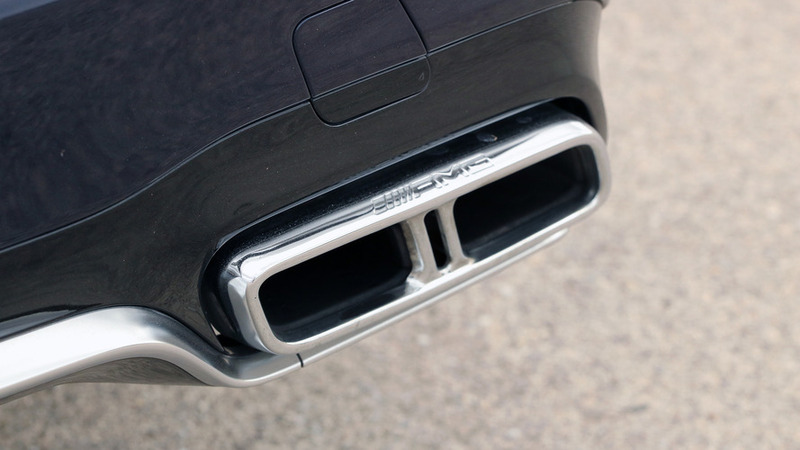 The outgoing E63 S 4Matic was rated 18 mpg combined. Before hitting the track, though, I have to get there. The first few dozen miles of roads leaving the Faro airport are dull, traffic-free freeways, so I have plenty of time to admire the E63’s handsome cabin. 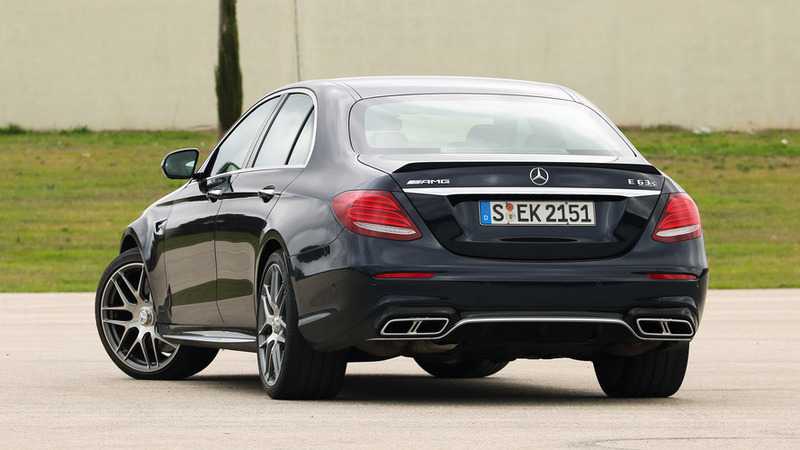 The basic bones of the W213-generation E-Class are fantastic in terms of refinement and technology. 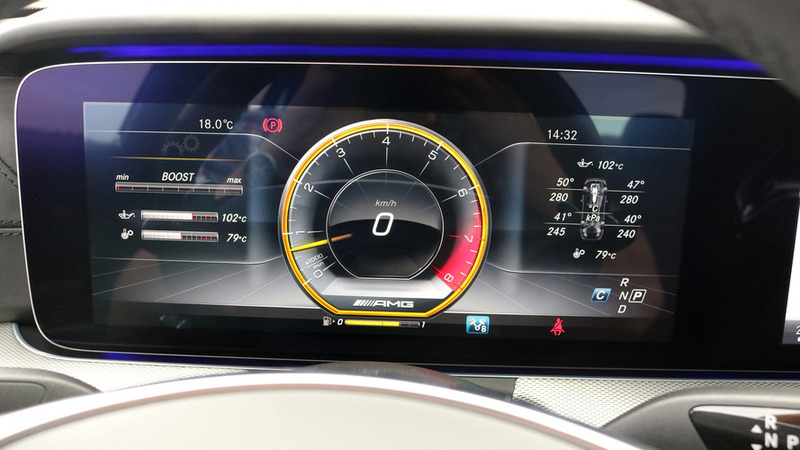 The 12.3-inch, full-color instrument cluster has three display themes and can switch between performance displays, trip information, navigation maps, and more. The matching 12.3-inch infotainment system is outstandingly simple to use, whether you operate it by the touchpad, rotary controller, right-hand steering-wheel buttons, or voice controls. The E63 is incredibly pleasant for a car with so much performance potential. The exhaust is hushed in the default Comfort driving mode, as are wind and road noises. Ride quality has a Germanic stiffness but is, overall, compliant and cosseting. And with all the regular E-Class’s option packs, like a color head-up display, the Drive Pilot semi-autonomous technology suite that includes steering assist, clear Burmester sound systems, and so on available, it’s a wonderful place to spend time. The nine-speed automatic allows the engine to purr at just 2,000 rpm at highway speeds, and slips delicately between gears without any fuss the rest of the time. 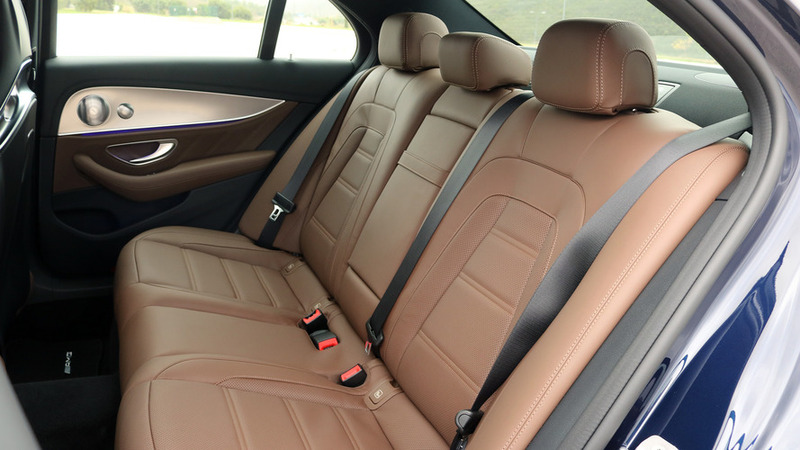 As in any E-Class, the back seat is quite roomy and the trunk generous. 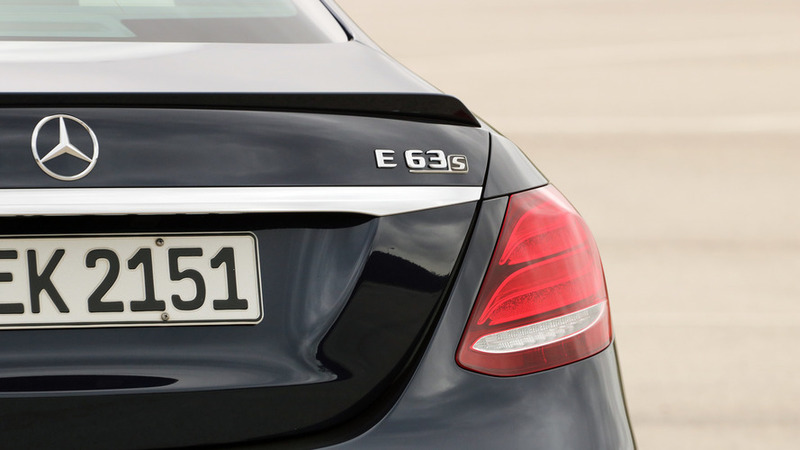 The basic bones of the W213-generation E-Class are fantastic in terms of refinement and technology. When the navigation directs me onto Portugal’s N266 and then the N267, things get much more exciting. These rippling two-lanes writhe up and down over hills past small villages, and there’s barely any traffic around besides other E63s. I slip the car into Sport+ mode and the transmission into manual to work out the big V8 – a change instantly confirmed by a growling, snapping, and popping exhaust note that reverberates through tunnels. The engine unleashes a veritable tsunami of torque from very low revs, and the transmission snaps up and down gears the instant I pull the paddles. The steering is perfectly sedate on-center, making highway driving relaxing, but as soon as you find a twisting road it’s rewardingly quick. Despite the standard 4Matic, this is no understeer machine; there’s a good amount of sliding possible when you deploy power through a curve. The overall sensation is one of control and precision, despite the heroic amounts of power and grip on offer. The E63 is, of course, still a Mercedes E-Class, so it’s perhaps a wider car than I’d choose to hustle through such narrow roads; when there’s oncoming traffic I stab the brakes and involuntarily hold my breath as I squeeze past. But hustle the E63 does, so much so that the estimated arrival time on the navigation display rapidly sheds minutes at a time. 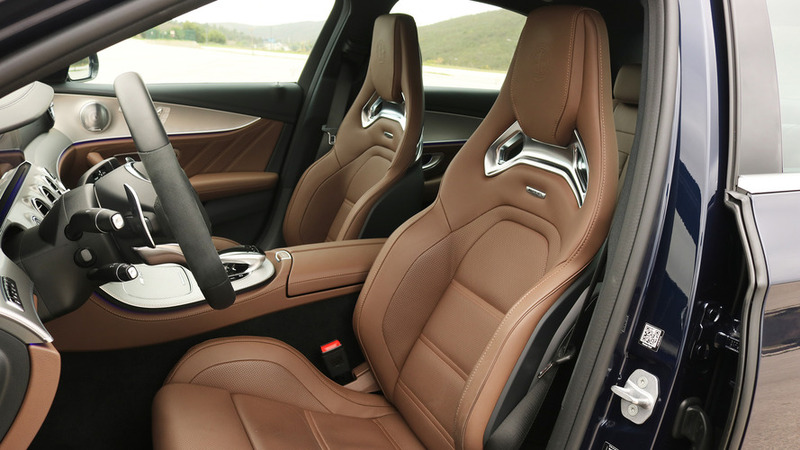 The latest AMG executive sedan has a brutally impressive engine, a sports car-sharp chassis, and an interior that’s not much less glamorous than that of the S-Class. One big letdown both on the road and on the track is lengthy brake pedal travel. The brakes work fantastically well, but there’s a disconcerting amount of pedal motion before anything happens, and little feedback once it does. Mercedes representatives counter that the cars had already been subjected to more than two weeks of abuse by journalists, so it’s possible the pads were worn. Still, I miss the sharp, right-now feel of the Cadillac CTS-V’s giant Brembos. By the same token, the steering could use more feedback; though the build-up of weight is very realistic and turn-in sharp, there’s little information from the front axle. That was fine when I drove the luxury-spec E300, but it’s a demerit in a car with this much performance potential. Still, there’s little else to criticize in this package. 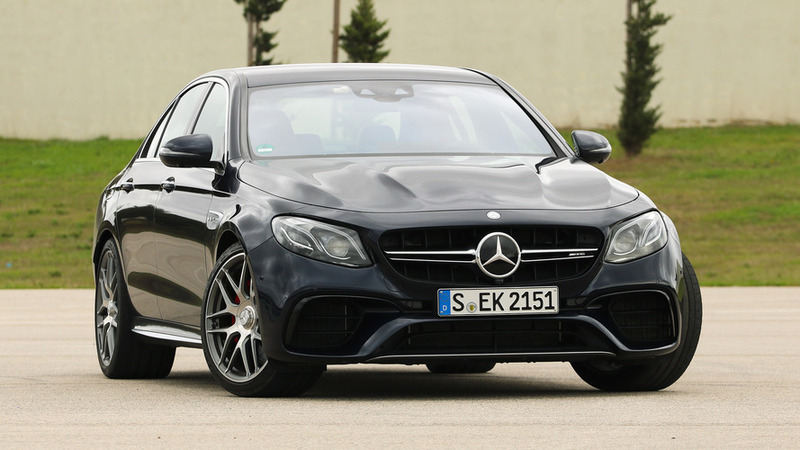 The latest AMG executive sedan has a brutally impressive engine, a sports car-sharp chassis, and an interior that’s not much less glamorous than that of the S-Class. And on the outside, it’s got just the right dose of visual aggression to excite gearheads without ostracizing ‘Benz traditionalists. The AMG appeals most of all because it’s so good at both the Jekyll and the Hyde sides of the performance-sedan game. Both the E63 and the E63 will start above the $100,000 mark, with exact prices to be named before the cars reach U.S. showrooms in summer 2017. Mercedes representatives say, however, that as with most AMG models, almost nobody will pick the non-S. After that, cross your fingers for a long-roof model: While the official word is just, “use your imagination,” it’s almost certain that a new E63 wagon will arrive in due course to go alongside the existing E400 wagon. The bottom line is that the new E63 S blows the outgoing BMW M5 out of the water, though we know a new one is on the way shortly, and stacks up well against Cadillac’s brutish and much more affordable CTS-V. Yet the AMG appeals most of all because it’s so good at both the Jekyll and the Hyde sides of the performance-sedan game. If you’ve got to cover lots of ground at high speeds, or decimate a race track on your way to meet your new partner’s parents, this is the car you want.